Rex Forehand, Ph.D. and Nicholas Long Ph.D. have helped thousands of parents achieve discipline using positive reinforcement, without yelling or harming the child’s self-esteem. Their clinically proven, five-week program gives you the tools you need to successfully manage your child’s behavior, giving specific factors that cause or contribute to disruptive behavior; ways to develop a more positive atmosphere in your family and home; and strategies for managing specific behavior problems. 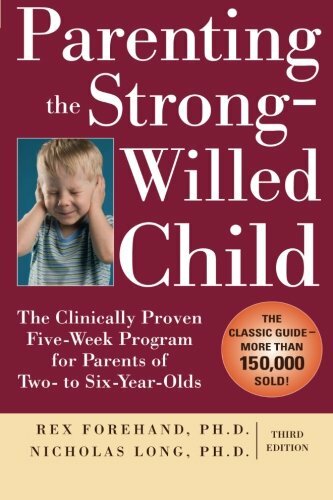 The completely revised and updated edition includes: new information, based on research, about child temperament; new chapter on the hot topic of play as a means of strengthening parent-child relationship; new section on collaborative disciplining with preschool teachers; expanded section about depression and stress linked to parenting; new research findings about ADHD and its treatment. Uncover the specific factors that contribute to your child’s disruptive behavior. Identify with real-life parent testimonials and discover strategies for managing specific behavior problems. Authors Rex Forehand, Ph.D., and Nicholas Long, Ph.D., are experts in the field of child psychology. New research highlights the scientific foundation behind the program.